Exhibits may be entered Friday evening between 6 and 8 p.m., or on show day 8.30 a.m. to 10 a.m. sharp. Articles are expected to be at least 50 years old. 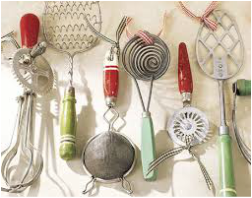 1.Kitchen utensils, eg tin openers, apple corers, egg beaters, ladels, meat mincers, rolling pins, etc. 3. Linen and clothing, eg aprons, oven gloves, caps, tablecloths, tea towels, etc. 6. Storage containers, eg porcelain storage containers, bread bins, preserve jars. 7. Jugs, eg milk, cream, gravy boats, etc. 8. Cook books or hand written recipes. 9. Saucepans, kettles, baking dishes, cake pans, moulds. 10. Early electrical appliances, scales and measuring equipment. AGGREGATE TROPHY donated by Show Society.